Shaenon: Oh my gosh, look at this! 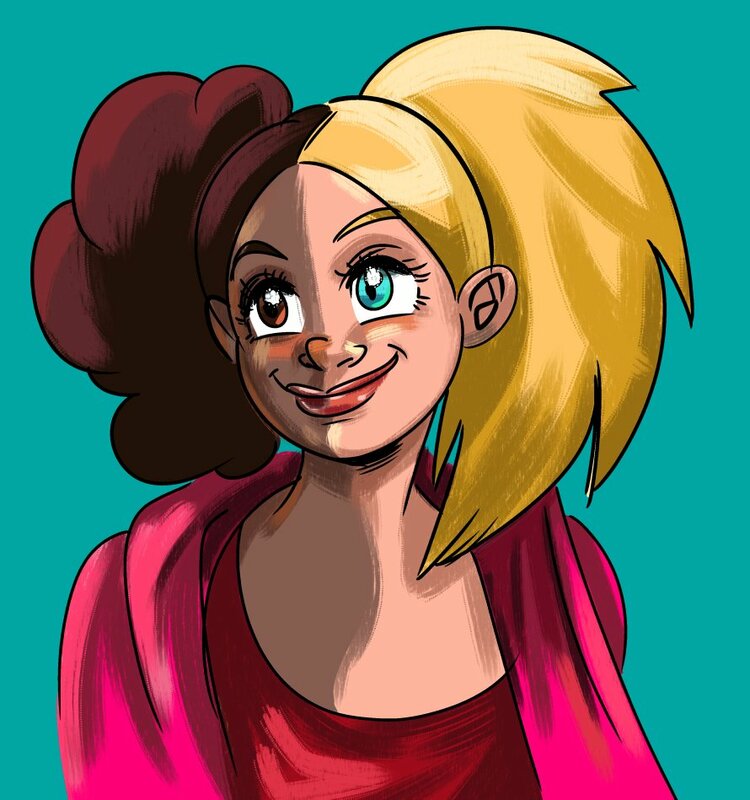 The wonderful graphic novel artist Tintin Pantoja drew a portrait of Unity. Thank you so much! I really want to work with Tintin on a comic, but I haven’t managed to write a good script. Sorry, Tintin! It will happen! Channing: Ee! That’s amazifying! I love the expression. Thanks so much! Well, don’t it make her brown eyes blue. Tintin Tours the Lairs of the Mads? The boy reporter goes on a mission to discover who designs and builds all of these impressive structures. A good way to work in that shopping mall/mad scientist lair on the rim of an active volcano and the atomic kitten catapult. Is that an atomic CATapult launching atomic kittens? Are they evil kittens like the one in Narbonic? That’s why they need to investigate. If the kittens are radioactive then Skin Horse needs to protect their rights. If it’s the catapult then it falls under the jurisdiction of the Tennessee Bureau of Mosquito and Mad Scientist Abatement. UNITY is cute when she’s not tearing you limb from limb. But she’s also cute when she IS tearing you limb from limb. Not many zombies can make that claim.